Does it seem overwhelming to think how you, just one person, can begin to respond to the needs of our world? Tough issues like poverty, lack of education, hunger and the HIV/AIDS pandemic seem too complex to solve alone. But we sincerely believe that you, one person, CAN make a huge difference. There are a number of ways you can become part of the solution. Some take seconds, some dollars, and others just a bit of commitment. Start Today! 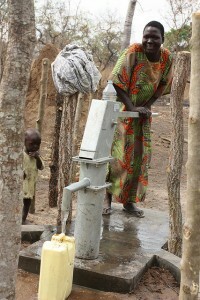 You can make an enormous impact on hundreds of lives by sponsoring a clean water well in Africa. For as little as $4,000, you, your school, church or even a group of your friends can choose to fund an entire clean water project. All it takes is a little time and a bit of passion to change the world. Check out our first well built with The Water Project HERE! You can support my efforts through The Water Project, Inc. by sponsoring a a well, where you, your church and community come alongside of us to raise money for The Water Project, Inc. in honor of Wake-Up Stand-Up. You can also make a one-time tax-deductible donation. 12/22/10 Chloe Canfield $30.00 Merry Christmas Lexi! You're a blessing. You inspire me. You have a love for the Lord that's evident even through your blog! Keep it up, girl! 12/09/10 Melissa Melvin $10.00 I am honord to be partnering wiht you, Lexi! Thank you for standing up for those in need. and calling othes to do the same.God bless you!